The United States Air Force's 18th Wing is the host wing for Kadena Air Base, Okinawa, Japan and is the Air Force's largest combat wing. It is the largest and principal organization in the Pacific Air Forces Fifth Air Force. The Wing's 18th Operations Group is a successor organization of the 18th Pursuit Group, one of the 15 original combat air groups formed by the Army before World War II. The 18th Wing's mission is to defend U.S. and Japanese' mutual interests by providing a responsive staging and operational airbase with integrated, deployable, forward-based airpower. The focus of the unit's operations is directed to accomplishing this mission. Strategy used to employ this mission centers around a composite force of combat-ready fighter, air refueling, airborne warning and control and rescue aircraft as well as medical aircrews tasked with transporting patients by air. The 18th Wing is composed of five groups each with specific functions. The Operations Group controls all flying and airfield operations. The Maintenance Group performs Aircraft and Aircraft support equipment maintenance. The Mission Support Group has a wide range of responsibilities but a few of its functions are Security, Communications, Personnel Management, Logistics, Services and Contracting support. The Civil Engineer Group provides facilities management, while the Medical Group provides medical and dental care. Team Kadena includes associate units from five other Air Force major commands, the Navy, and numerous other Department of Defense agencies and direct reporting units. In addition to the aircraft of the 18th Wing, associate units operate more than 20 permanently assigned, forward-based or deployed aircraft from the base on a daily basis. The 18th Fighter Wing was established on 10 August 1948, and activated four days later at Clark Air Force Base. On 20 January 1950, the wing was re-designated the 18th Fighter-Bomber Wing. North American F-51D-30-NA Mustang, AF Ser. No. 44-74651, cira 1950. This aircraft was deployed to South Korea and is marked as the Wing Commander's. North American F-86F-25-NH Sabre, AF Ser. No. 52-5371, of the 18th Fighter-Bomber Group, 1953. Aircraft marked as Wing Commander's. At the outbreak of the Korean War, the 18th FBG's 12th FBS provided personnel to form the "Dallas" fighter squadron, which rushed into battle. In late July, the group headquarters with two of its squadrons (12th and 67th FBSs) deployed with F-80s from the Philippines to Taegu AB (K-37), South Korea. 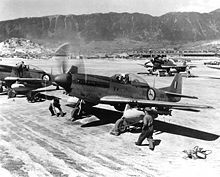 In August, advancing enemy forces and insufficient aircraft parking at Taegu forced the group to move to Japan, but it returned to South Korea the following month to support UN forces in a counteroffensive. Because the front advanced so rapidly, operations from Pusan East (K-9) Air Base soon became impractical, and the group moved in November to Pyongyang East Air Base (K-24), North Korea. The 2nd SAAF Squadron joined the 18th in mid-November. Maj Louis J. Sebille was posthumously awarded the Medal of Honor for his action on 5 August 1950: although his plane was badly damaged by flak while attacking a concentration of enemy trucks, Maj Sebille continued his strafing passes until he crashed into an armored vehicle. The group remained in Korea for some time after the armistice. The wing was reassigned to Kadena Air Base, Okinawa in November 1954. 18th TFW North American F-100A-15-NA Super Sabre Serial, AF Ser. No. 53-1587, landing at Kadena Air Base. Republic F-105D-31-RE Thunderchief, AF Ser. No. 62-4375, 12th TFS/18th TFW on 18 May 1971. Noted in October 2003 at the Combat Air Museum, Topeka, KS and still there October 2006, this F-105 was the last of its kind in use with any US military service when retired from the Air National Guard in 1983. It was a static display for four years at McGhee Tyson ANG Base, Knoxville, Tennessee, prior to transfer to the Combat Air Museum in 1992. McDonnell F-4C-18-MC Phantom, AF Ser. No. 63-7474, 67th TFS/18th TFW (photo taken at Korat RTAFB, Thailand). This aircraft was later modified to the EF-4C Wild Weasel flak suppression aircraft. Douglas RB-66B-DL Destroyer (Modified to EB-66E), AF Ser, No. 54-0542, 19th TEWS/18th TFW on 23 August 1974. McDonnell Douglas F-15C-22-MC Eagle Serial, AF Ser. No. 78-0497, 67th TFS/18th TFW on 13 October 1984. Flying the North American F-86 Sabres, the wing supported tactical fighter operations in Okinawa, as well as in South Korea, Japan, Formosa (later Taiwan), and the Philippines with frequent deployments. In 1957, the wing upgraded to the North American F-100 Super Sabre and the designation was changed to the 18th Tactical Fighter Wing. In 1960, a tactical reconnaissance mission was added to the wing with the arrival of the McDonnell RF-101 Voodoo and the 15th Tactical Reconnaissance Squadron (Tail Code: ZZ) The McDonnell Douglas RF-4C Phantom II replaced the RF-101 in the reconnaissance role in 1967. The deployments to Southeast Asia continued until the end of United States involvement in the conflict. An electronic warfare capability was added to the wing in late 1968 with the reassignment of the 19th Tactical Electronic Warfare Squadron from Shaw AFB, South Carolina flying the Douglas EB-66E Destroyer (Tail Code: ZT). The B-66s remained until 1970, flying daily over the skies of Southeast Asia. During the 1968 Pueblo crisis, the 18th deployed between January and June to Osan Air Base, South Korea following the North Korean seizure of the vessel. Frequent deployments to South Korea have been performed ever since to maintain the air defense alert mission there. The McDonnell Douglas F-4C/D Phantom II replaced the F-105s in 1971, and a further upgrade to the McDonnell Douglas F-15 Eagle was made in 1979. In May 1971, the 556th RS was also transferred from Yokota to Kadena with Martin EB-57E Canberra aircraft (Tail Code: GT) to the wing. It inactivated in 1973. In 1972, the 1st Special Operations Squadron was assigned, bringing their specialized C-130E-I. (Combat Talon) The RF-4C reconnaissance mission ended in 1989 with the transfer of the RF-4Cs to the 460th TRG at Taegu AB in Korea. The designation of the wing changed on 1 October 1991, to the 18th Wing with the implementation of the Objective Wing concept. The original designation, as determined by the then Wing Commander, Brigadier General Joseph Hurd, was 18 Wing; meant to mirror the numbering convention of the Royal Air Force. This was quickly changed however when it was disapproved by PACAF but there are coins, etc. from this time period that depict the wing's designation as 18 Wing. With the objective wing, the mission of the 18th expanded to the Composite Air Wing concept of multiple different wing missions with different aircraft. The mission of the 18th was expanded to include aerial refueling with Boeing KC-135R/T Stratotanker tanker aircraft (909th ARS); and surveillance, warning, command and control Boeing E-3B/C Sentry (961st AACS), and communications. Added airlift mission in June 1992 with the Beech C-12 Huron, transporting mission critical personnel, high-priority cargo and distinguished visitors. In February 1993, the 18th Wing gained responsibility for coordinating rescue operations in the Western Pacific and Indian Ocean with the addition of the 33d Rescue Squadron (33d RQS). In November 1999, the 18th Wing underwent another change as one of its three F-15 units, the 12th Fighter Squadron, was reassigned to the 3d Wing at Elmendorf Air Force Base, Alaska. In 2003 the 374th Aeromedical Evacuation Squadron at Yokota Air Base, Japan was moved to Kadena and redesignated the 18th AES giving the 18th Wing an added mission of patient transport. 18 AES crews utilize the KC-135s of the 909th ARS as well as other opportune aircraft including the C-17 and C-130. Between 24–31 March 2006, during Foal Eagle 2006 exercises, aircraft from the 18th Wing teamed with the U.S. Navy's Strike Fighter Squadron 151 (VFA-151) from Carrier Air Wing Two (CVW-2) to provide combat air patrols and coordinated bombing runs via the exercise's Combined Air Operations Center. The 18th Wing has earned many honors over the years, including 17 Air Force Outstanding Unit Awards. 35 Fighter-Interceptor: attached 7–24 May 1951. ^ a b Robertson, Patsy (2 April 2014). "18 Wing (PACAF)". Air Force Historical Research Agency. Archived from the original on 27 September 2015. Retrieved 5 February 2017. ^ Photographer's Mate 3rd Class (AW) M. Jeremie Yoder, USN (27 March 2006). "Lincoln Wraps Up Successful Exercise, Heads for Port". NNS060406-15. Abraham Lincoln Public Affairs. Retrieved 26 December 2010. ^ Haulman, Daniel (8 May 2017). "Factsheet 3 Air Support Operations Squadron (PACAF)". Air Force Historical Research Agency. Retrieved 1 August 2018. This article contains information from the 18th Wing history factsheet which is an official document of the United States Government and is presumed to be in the public domain. Wikimedia Commons has media related to 18th Wing (United States Air Force).